Avery a Member of Penguin Group (USA), 9781583335390, 278pp. "M*A*S*H" meets "Scrubs" in a sharply observant, darkly funny, and totally unique debut memoir from physical therapist Adele Levine. In her six years at Walter Reed Army Medical Center, Adele Levine rehabilitated soldiers admitted in worse and worse shape. As body armor and advanced trauma care helped save the lives if not the limbs of American soldiers fighting in Afghanistan and Iraq, Walter Reed quickly became the world leader in amputee rehabilitation. But no matter the injury, physical therapy began the moment the soldiers emerged from surgery. Days at Walter Reed were intense, chaotic, consuming, and heartbreaking, but they were also filled with camaraderie and humor. Working in a glassed-in fishbowl gymnasium, Levine, her colleagues, and their combat-injured patients were on display at every moment to tour groups, politicians, and celebrities. Some would shudder openly at the sight but inside the glass and out of earshot, the PTs and the patients cracked jokes, played pranks, and compared stumps. With dazzling storytelling, "Run, Don t Walk" introduces a motley array of oddball characters including: Jim, a retired lieutenant-colonel who stays up late at night baking cake after cake, and the militant dietitian who is always after him; a surgeon who only speaks in farm analogies; a therapy dog gone rogue; and Levine's toughest patient, the wild, defiant Cosmo, who comes in with one leg amputated and his other leg shattered. Entertaining, engrossing, and ultimately inspiring, "Run, Don t Walk" is a fascinating look into a hidden world. Adele Levine, P.T.is also a lover of long distance open water swimming and late-night urban cycling. She lives in Wheaton MD." "Adele has captured the unique, frenetic, protective world that was Walter Reed Army Medical Center from 2003 until its closure in 2011. Her dedication and the dedication of all who labored mightily there to save and rebuild our Wounded Warriors’ broken bodies and detoured lives is an overlooked part of modern warfare. Reading this book brought me right back to the hours I spent on a treatment table surrounded by my fellow Wounded Warriors as we pushed each other, using grit, gallows humor and even bribes of cookies in order to face yet another day of pain on our road back to our new futures. Read this book to gain a window into an aspect of combat and a cost that our troops, their families and their caretakers must bear that is no less heroic than those of the battlefield. " 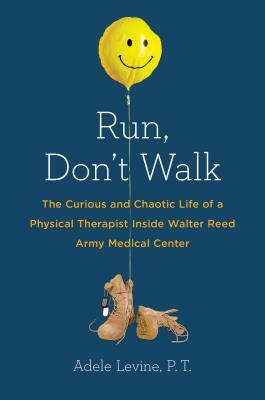 "Run, Don't Walk captures the essence of what it was like to be at Walter Reed during its darkest days. And it is told by one of the true un-sung heroes of the wounded from the wars in Iraq and Afghanistan: The Physical Therapist. It is heartbreaking and hilarious. Levine captures the disappointments, the heartache and the triumphs of the injured troops and the spirit of those determined to save them. Truly a remarkable book that tells a side of the war story very few ever witness or live to tell about." "I've never read anything like Run, Don’t Walk, except possibly the first chapter of Catch 22. Humor heals, comforts, and saves. Don't take my word for it. Read this magnificent book."